The Visual Science Lab / Kirk Tuck: Going all the way into a system. Going all the way into a system. Yeah. This will come as no great shock to anyone who's been following the VSL blog for any appreciable about of time. It's the part in our program where I rationalize switching systems yet again. So, buckle up and lets get started in the big, happy game called, Fantasy Camera Bag rationalization. Emphatic disclaimer: I have received absolutely nothing from Panasonic or Sony. No free gear. No under the table or over the table money. In fact, the money flows in one direction: from my wallet to their accounts. I am not being loaned any gear, I have not requested any gear. No one is putting a gun to my head to make this switch nor are members of my family being held hostage awaiting the outcome of this anticipated trade. As many of you know I started doing video projects back when I owned the Canon 5D mk2 and I upgraded to the Sony a99 because, on paper, it looked to be a great hybrid solution for someone who wanted to shoot both high res stills and very controllable video. By controllable I mean that the interface would be simple and straightforward enough to handle manual control of sound levels from external microphones, focus easily via live view through the viewfinder (EVF) and yield beautiful, sharp files. The Sony a99 does two of those three things very well. The front programmable control meant that I could change sound levels on the fly with on screen confirmation. If I wanted to ramp up my sound control I could ante up an additional $800 and have XLR inputs and cleaner pre-amps. The focusing set up was also good and allowed for AF while shooting or magnified focusing during set up, along with focus peaking (not available during video shooting). But where Sony stumbled was in the visual part of the equation. I struggled with this until last fall when I bought the first of my Panasonic GH3s. That camera was an eye-opener for me. It checked all three boxes and checked them well. The audio implementation is straightforward and the sound files are clean and full. The AF works as well in video mode as the bigger and more expensive Sony and the image files absolutely blow away the a99. It's night and day. Now, I have to preface this by saying that I am comparing what's coming out of the cameras on my memory cards. I understand that I can pull uncompressed files out of both cameras that look really, really good but I am looking for a very straightforward work flow and I much prefer not having to have an outboard digital video recorder in the loop. At all. Much for the same reason that I usually don't use my Zoom HN4 digital audio recorder....too many steps for no enough reward. I did several projects for Zach Threatre with the GH3 and several for Austin Radiological Associates as well. In each case the GH3 delivered better files than the Sony a99 I had used previously. And, with the Panasonic I was able to use a much wider array of really decent optics from as far back as the 1960's. I am even able to repurpose the Rokinon Cine lenses for use with the GH3. I recently did three jobs with different cameras and the net results were enough to push me over the edge and make me consider finally dumping the Sony stuff and going fully back into m4/3. One job is a video that I shot here and in Chicago for a technology client. I was able to use two of the GH3s to shoot two different POV's simultaneously. The system packed down so well it fit under my airline seat. The footage was wonderful. I shot portraits a few days after the completion of the video shooting with the same cameras and loved the look I got with the GH3s coupled with the old, adapted, Olympus Pen F lenses. The raw files were just great! And the footprint was much reduced. Both on the shooting days and in post. Finally I looked at my perception of Sony's roadmap into the future and I came to the conclusion that, rumors to the contrary, that Sony's support for the traditional Alpha DSLT line of cameras and lenses would waver and then fall of the side of a crumbly cliff. Regardless of what Sony say I believe that they will put all their resources into cameras like the A7 and A7r as well as fixed lens cameras like the Sony RX10 ( which I still love ) and the R1X. Neither solution really made me happy. I could be wrong and Sony could come out with a replacement that fixes everything but I think it will cost too much and require new lens purchases to realize its potential. Looking into the equipment cabinets I realized that I had to make too many choices when going out to shoot jobs and I'm still of the mindset that so much of our work will be web res and video going into the future. Tomorrow the Sony stuff will get boxed up and sent away. The next time I step out of the studio and head off toward the land of super models and caviar it will be with two GH3's, a 35-100mm f2.8 and its companion, the 12-35mm 2.8. Joining them a bit later in the second quarter (waiting just long enough to see if there are any big gaffs) will be a GH4. Everyone in the equipment drawer (with the exception of the Samsung) will be able to use the same lenses and the same flashes. Joy!!! Of the Sony collection I'll be keeping some Sony stuff I'm holding on to the Sigma 70mm Macro because it's the single sharpest lens I own right now and the best macro I could imagine. I'll get rid of the 58 flash with the funny shoe but will keep the 60HVL to use with the RX10. The RX10 isn't going anywhere! The idea of 24-200mm equivalent in a small package is a wonderful thing to savor and roll around on the tongue of one's mind. One small bag. Many possibilities. Had I never started shooting video for money I'm not sure I would ever have made the leap. But when I compare even the stills side by side my feeling is that some lenses make more of a difference than even the sensor size or the pixel count. I am ready to downsize.....again. Let you know how it all turns out. Yeah, sometimes things suddenly fall into place, an 'aha' moment. After using my E-M5 & two lenses for several months the Minolta AF and Sony digital collection seemed superfluous (especially since VS100 went away) and was sold en mass to KEH. My Canon F-1 and few lenses & items handle the remaining print film duties/itch, which is rarely affected by the F-1's non-matrix meter. Personally I never understood the high excitement of having a meter go beyond 1 second (other than not having to count), as a few sec. off on either side of a 20 second exposure is nil. Less is More. I'm shocked - shocked! - to find system-switching going on in this establishment! Seriously, this comes as absolutely no surprise. Anybody who shakes there head about limited sensor-size or whether the gear meets "client expectations" or whatever clearly doesn't get that you're a visual communication professional selling story-telling, project management, and vision, for which the GH cameras are compellingly transparent tools. Take a look at the Olympus 60mm macro for m43. Rave reviews, and its very small and light. Thanks for sharing. It's good to read your rationale. The GH3 is a wonderful video/still system and that's my consideration. I just got tired of picking and choosing based on assignments. Sooo...You're the reason that B&H has increased the price of the GH3 body by $400.00 in the past week! I knew it! No,wait; I recall you bought your GH3 just before a price reduction. Kirk, please...don't do anything with the GH4 just yet! Dr. MIckey, We're both safe on the GH4. How can they raise the pre-order price above retail? It's an amazing system. I've been wondering when you'd jump in. No surprises here, I saw this one coming many weeks ago. Kirk, as a regular reader, I like it when you change systems. Makes for a good read and I get to learn about new gear without spending the money. Just curious, why not the Oly EM1? Despite all the switching about, you've remained consistent in at least two things: the quality of your blog and your reliance on the Epson V500 photo scanner. I finally bought one. It is spectacular! I've only run a few 35mm Kodachrome slides on fully automatic at this point, but who would have thought a $150 flatbed scanner could pull that quality out of a bunch of 40-year-old slides stored in a shoebox? Couldn't agree more about simplifying our decision making processes. I was a FF Nikon guy for years and ignored the m4/3 lure for a long time. After making the switch to a GH3 w/the 12-35/35-100 f/2.8 combo, I realize the benefits of a simple, light weight and very versatile system. Having a workable system, i.e., camera, two lenses covering a wide focal range, microphone, Zoom X1 recorder, flash, batteries, etc., that I can carry in my shoulder bag has made it less work and, perhaps most importantly, more fun. I enjoy reading your experiences with this system - and w/your video work in general, and look forward to that with the GH4. Enjoy the blog and appreciate your sharing it with us! I'll second the Olympus 60mm macro. It is a very nice lens. I'm using it on my EP2 to produce fine art prints of terrestial orchids, and I'vejust got back from a trip where I shot a lot os close up video with it and it handles everything with aplomb. The only thing that makes me sad about you switching to m43s is that you'll be switching away again sometime. I remember you had to upgrade to a higher resolution sensor which was one thing that drove you away from 4/3s in the first place. Is that no longer in demand, or is 16MP enough? Do you still have a solution for jobs that require more than 16MP? For the first time since I've been a photographer it's actually easy to rent whatever camera and lens you need for a specific job and that means you can rent exactly the camera you need for the job at hand. We have five more videos to do for one client this year and that's all GH3 or GH4. If a remarkable print job comes up and I need an amazing number of pixels I'd like to try renting one of the really expensive medium format cameras for it. Ah choice. Maybe you should look at selling the A99 and the GH3 and picking up the new A6000. The early reports over at EOSHD are that it is better than the GH3. You then get to enjoy your A-mount lenses as they were intended - on the A850 and you can adapt them for video or use legacy glass on the A6000. i love this topic and site very nice.i fell the site and also related site women gift baskets is my site. plz visit that site and command hear.Enjoy the blog and appreciate your sharing it with us. At least when you switch again you can use a smaller box. In the mean time can't wait to see some portraits. I'm going with the iPhone 5 for now with my post-processed SnapSeed and VSCO Cam 6x9" images printed on Red River Polar Matte paper. Panos look exceptional, too. Looking forward to iPhone 6 or whatever else might be king in the world of "mobile" when my contract's up in November. No more D800 and lenses that back and front focus. No more awkward P&S's or in-betweeners. The Panasonic/Leica 42.5 mm f/1.2 is coming up for u 4/3. Should be a great portrait lens. 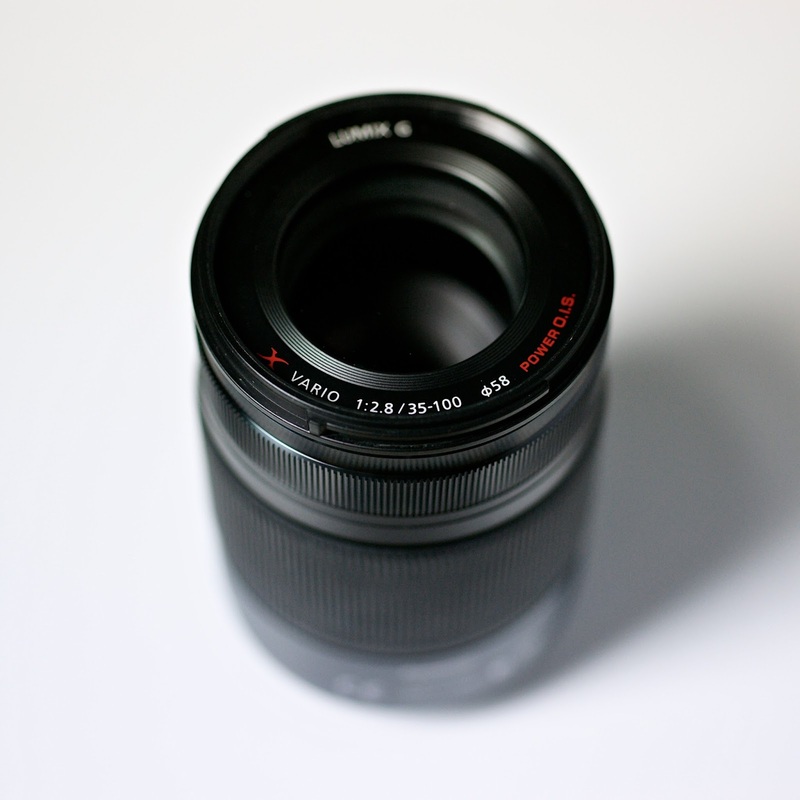 Rented the Panasonic/Leica 25 mm f/1.4 for the OMD5 once. What a wonderful lens. Great contrast and sharp. Nowadays it is easy to rent anything from fancy pocket cameras to Profoto lights online. "It's the part in our program where I rationalize switching systems yet again." Not that there's anything wrong with that, it's just how the cookie crumbles, and the other systems will have some interesting new pieces of gear, too. "Much for the same reason that I usually don't use my Zoom HN4 digital audio recorder....too many steps for no enough reward." Well, just you wait. When you really get in touch with your inner filmmaker and audio geek, you won't be leaving house without an outboard audio recorder. Because of the additional reward. It might help if you get yourself a simpler and smaller recorder to accompany the H4, like the H1n, along with a lavalier, for example. Much easier to carry and to hide. Even when using cameras with decent audio recording capabilities like the RX10 and/or the GH3, I would still find it rewarding to pack a H1 or something like it for a shooting gig. As for the outboard video recorder, well, I'm waiting for the delivery truck to deliver mine while I'm typing this. I already have a $12 "rig" to attach it to the RX10 with, along with a mic. I'm expecting it to improve both the quality of the footage and my editing workflow, as well as flexibility, for a little added inconvenience. The monitor/recorder would also add features like zebras and focus peaking to cameras that don't have them built in. I'll find out soon whether or not the rewards vs clumsiness/bulkiness ratio is good enough. I hope it is. I'll let you know if you're interested. Kirk give your old Nikon 55mm a shot on the GH3. It did great things on my GH2 and equally nice on my Fuji XE1. Ditto for the "old" Nikon 75-150mm f/3.5. On M43 you get a 150-300mm f/3.5 lens and the looseness of the push/pull and focus mechanisms makes for smooth video operation. When I went to ImagingUSA earlier this year, the camera that I handled that had me most excited was Panasonic's GX8. That camera felt so right in my hands. Video's not yet in my workflow, but playing with the GH3 has made less fearful of testing the waters. And, since you talked me into Olympus Micro 4/3s a few years ago, you may be swaying me yet again. My CFO would like a word with you . . .
Mike! GX8???? How did I miss this? What's a GX8? Welcome back to m43! Honestly, if I shot more video, I'd consider doing the GH3 thing, too. But the E-M1 fits my life better (obscenely-good weather-sealing -- check!). BTW, it's a good thing your approach to camera gear doesn't carry over into your regular life. At least, I suspect your wife feels that way. Cool. It's always interesting to see how things progress for you as a professional. I haven't rented yet, but I've been fairly stable going from 4/3s to m43s and both are more than adequate for my prints needs. I'll be interested how you get long with them in the still image area too. I came to the same conclusion a few months ago. I was just bowled over by the GX7 and the tiny 12-32 zoom lens that comes with the GM1 (I have that, too). For travel (what I do) it's a killer combo. Throw in the Oly 45/1.8 and the new Pan/Leica 15/1.7..whenever it gets here.. and I'll be set. Excellent video with this set up as well although not as versatile as the GH3 and coming GH4...but more than adequate. Ooops, just got back to reading this, so I apologize. I meant their GX7. It felt like the rangefinder I never could afford. Sorry for the confusion!